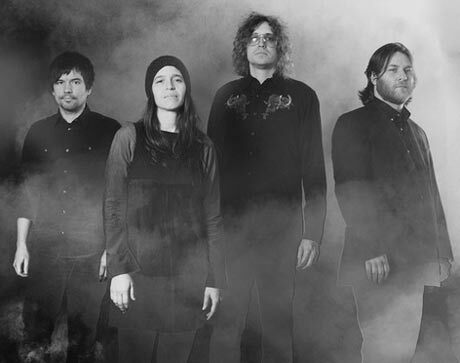 Since forming in 2003, The Besnard Lakes have released three albums, all to great critical acclaim, and the latter two of which have been nominated for the prestigious Polaris Music Prize in 2007 and 2010 respectively. But despite this considerable success, their appearance at Golden Plains this year and sideshows along the East Coast mark the band’s first Australian tour. But we’ll get to them in due time. The opening act for this particular Saturday night at the Corner Hotel in Melbourne is Lady Strangelove, a psychedelic four-piece from Adelaide (the thoughts of many Melburnians about the fair city being echoed by vocalist, Brendan Shaw, when he states, ‘we’re from Adelaide, don’t go there’). Playing mostly material written for their upcoming album, Lady Strangelove show off their repertoire to the small-yet-enthused crowd, but as someone who has seen them perform quite a number of times, the set is lacklustre compared to their usual efforts. They are forced to cut the last song from their set so as to not run overtime, and it finishes on something of an anticlimactic note, leaving both band and audience dissatisfied, and they exit the stage with a somewhat-bigger-and-appreciative crowd. This isn’t really the forum to put forth my views on triple j, but for the purposes of this review, I’ll say that it had been a while since they’d exerted a lot of energy plugging a band who I thought was deserving of it. As a result, my knowledge of Stonefield didn’t extend much further than knowing they were young, and girls. Moments after their set begins, my skepticism about the band is completely shot down. There are a lot of novelties in Stonefield; they are four sisters aged between 12 and 20, and the drummer is also the vocalist. Historically, all-girl groups haven’t been nearly as successful in rock music as their male counterparts, but it quickly becomes apparent that Stonefield are not a ‘girl band’. They exude an energy and enthusiasm that makes perfectly clear why they’ve been winning crowds over, and although their particular brand of rock ‘n’ roll lacks the grit that has often gone hand in hand with the genre, their cover of ‘Whole Lotta Love’ shows that with just a little coaxing, these girls have got it. The band room fills up before The Besnard Lakes take the stage, led by husband and wife founders, Jace Lasek and Olga Goreas. The simplest way to describe The Besnard Lakes is to say that they epitomise both the best and worst things about the shoegaze genre. The music meanders whilst droning, is ambient whilst repetitive, somewhat experimental but entirely consistent. Granted, this is mixed in with and complemented by some mid-tempo indie-anthemic tracks, but the sound is never quite extended enough to feel like it’s offering something significantly different to fellow Montreal-habitants (note: obvious comparison), Arcade Fire. They sound like a little bit of all the bands they are readily compared with, most notably Pink Floyd and The Beach Boys (mostly heard in Lasek’s Brian Wilson-esque falsetto), but given the prominence of these influences in many of today’s bands, The Besnard Lakes don’t show themselves to be quite as successful in melding these influences as many of their peers. Nonetheless, the band does have a warmth about it, both in their music and demeanour, with Lasek and Goreas occasionally taking pause to adjust one another’s hair, and exchanging the odd bit of pleasant banter with the audience, who never seem anything less than enthralled with the performance. This entry was posted in Arts, Music and tagged corner hotel, lady strangelove, stonefield, the besnard lakes. Bookmark the permalink.